If you spend a lot of time creating ConfigMgr 2012 R2 OSD Task Sequences, you probably have a method for inserting the steps and groups that you like to use in every TS you create. Maybe you open a reference TS up and copy and paste steps into a new TS that you are creating. Maybe you export and import your favorite task sequences or just right-click on one and copy it in the console. 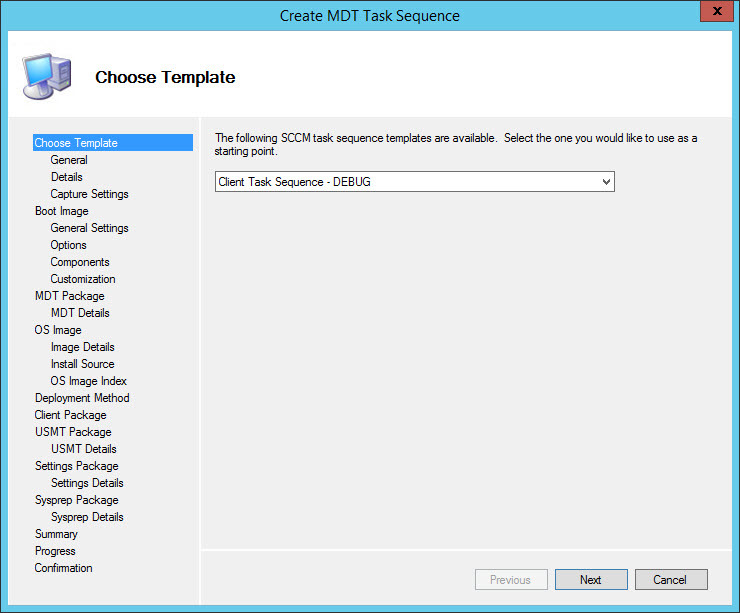 Wouldn’t it be great if you could just create a template of your favorite task sequences and be able to pick them when running through the Create MDT Task Sequence wizard? Yeah – I was thinking the same thing one day and decided to see if I could do it. For step #1, depending on the steps that you add in the task sequence, you might need to clean them up a bit. For example, if you have a reference package in a step, you might disable the step if you plan on using the template in another ConfigMgr site. Do the same for anything that is unique or you do not want shared. In these cases, there might be minor edits that need to be made to the task sequence after running through the Create MDT Task Sequence wizard. The benefit is the time saving and all of the groups and steps are in the correct order in the task sequence. For step #4, save the file and copy it into the SCCM directory where the Microsoft Deployment Toolkit is installed (i.e. C:\Program Files\Microsoft Deployment Toolkit\SCCM). Test it out to make sure it works and then share it with your coworkers, friends, local user group, etc. !